The 21-μm and 30-μm bands are the strongest dust emission features detected in evolved low- and intermediate-mass C-rich stars (i.e. asymptotic giant branch (AGB) stars, proto-planetary nebulae (PPNe), and planetary nebulae (PNe)). While the 21-μm feature is rare and exists only in the transient PPN phase, the 30-μm feature is more common and seen in the entire late stage of stellar evolution, from AGB to PPN and PN phases, as well as in the low-metallicity galaxies: the Large Magellanic Cloud (LMC) and the Small Magellanic Cloud (SMC). The carriers of these features remain unidentified. All the 21-μm sources also emit in the 30-μm band, suggesting that their carriers may be somewhat related. The circumstellar chemistry of the low- and intermediate-mass stars from the asymptotic giant branch (AGB) on is dichotomized into O-rich and C-rich classes according to the C/O abundance ratio, since C and O would combine at relatively high temperature to form the very stable molecule CO. The dominant dust species in the O-rich circumstellar envelope (CSE) is silicate, abundant in both amorphous and crystalline forms. In C-rich objects, the C-bearing molecules (e.g., C2, C3, CN, and some hydrocarbon compounds) dominate, while the most common dust feature should be assigned to the SiC 11.3-μm band detected in more than 700 stars, most of which are C-rich objects. However, the strongest and most enigmatic spectral features of C-rich objects are the 21-μm and 30-μm emission bands. The combined contribution of these two bands can amount to more than 20% of the total infrared flux, so they greatly influence the evolution of the CSE. Furthermore, the dispersion of the CSE dust to the interstellar medium (ISM) brings the dust for these features into the recycling process of cosmic dust. The 21-μm feature was first identified in four protoplanetary neblae (PPNe) from the IRAS/LRS spectra in 1989 (Kwok et al., 1989). Later, from the high-resolution spectra taken by ISO/SWS, this feature is accurately measured to have a peak wavelength at ∼20.1 μm. However, the tradition to name it as the 21-μm feature has been retained. As one of the rarest dust features detected to date, this feature has been well identified only in sixteen sources (see Hrivnak et al., 2009). Consistent with its rare appearance, the 21-μm sources all are at a short phase in stellar evolution, i.e., PPNe, which lasts only several ∼103 years. They show a double-peaked spectral energy distribution (SED), with one optical peak arising from the radiation of the central star (with an effective temperature of ∼5500–7500 K) and the other (usually mid-) infrared (IR) peak from the low-temperature dust envelope. In addition, all these 21-μm PPNe are C-rich, metal-poor but rich in sprocess elements, which is a quite small subgroup of PPNe (Kwok et al., 1999). Since its discovery, the 21-μm feature has attracted a lot of attention for its unidentified carrier. The number of proposed carrier candidates is comparable to the number of the feature emitters. The proposed candidates fall into three broad categories: (1) organic dust, (2) oxides, and (3) the silicon and carbon compound. Because the 21-μm emission band is found only in C-rich sources, the C-bearing organic dust species are naturally considered to be the carrier candidates, including hydrogenated fullerenes, polycyclic aromatic hydrocarbon (PAH), hydrogenated amorphous carbon (HAC), synthetic carbonaceous macromolecules, and amides (especially urea). In addition, inorganic candidates are proposed: diamonds, iron oxides (λ-Fe2O3, Fe3O4, FeO), SiS2, titanium carbide nanoclusters, doped SiC, and SiC core-SiO2 mantle particles, some of which also contain carbon atoms. Posch et al. (2004) discussed in detail many of these proposed candidates. The proposal for these materials to be the 21-μm feature candidate is generally based on their experimental spectra, which show a feature around 20 μm similar to the observed 21-μm feature profile. But a valid carrier needs not only to be able to reproduce the observed feature, but also (1) to be abundant enough to account for the observed intensity and (2) to not have any associated features, consistent with the observational fact the 21-μm band has no appreciable associated features. For example, since titanium is a rare element in the universe, Ti-bearing dust species are often examined in terms of the required abundance (relative to H), e.g., titanium carbide (TiC) nanoclusters were rejected because the cosmic Ti abundance is not enough to account for the intensity of the observed 21-μm emission feature (see Chigai et al., 2003; Hony et al., 2003; Li, 2003). where nX is the number of X atoms per molecule, μd is the molecular weight of the dust, and MH is the total H mass of the circumstellar envelope of the star. Therefore, with the mass absorption coefficient κabs experimentally measured or theoretically calculated, the required abundance of specific element X can be calculated from the observed feature intensity. For the strongest 21-μm feature source HD56126 (also known as IRAS 07134+1005), the total power emitted through the 21-μm band is Etot ≈ 1036 erg s-1 (i.e., about 300L⊙). From this abundance requirement, both the TiC nanoclusters and the fullerenes coordinated with Ti atoms originally suggested by Kimura et al. (2005b) are disqualified to be the carrier due to the shortage of element Ti; the same fate is for SiS2 from the shortage of element S (SiS2 also can not satisfy the criterion on the associated features) (Zhang et al., 2009). Although the 21-μm feature is discovered only in C-rich sources that exhibit additional spectral features arising from C-bearing molecules, it has no clear association with any other features. As we will discuss later, all the 16 known 21-μm sources emit at the 30-μm feature as well, but their intensities are not correlated at all. On the other hand, the proposed carrier candidates often exhibit additional spectral feature(s) (aside from the 21-μm feature). A typical example is the SiC dust (responsible for the most popular dust feature in C-rich sources at 11.3 μm). The suggestion for SiC to be the 21-μm feature carrier must pass the examination that the expected intensity ratio of the 11.3-μm feature to the 21-μm feature should agree with the observed value of I (11.3 μm)/I (21 μm) <0.01 (Jiang et al., 2005). Detailed calculations have shown that this is impossible from the optical properties of SiC (Jiang et al., 2005). The same examination has been applied to other inorganic carrier candidates. This requirement rules out all the candidates which exhibit associated feature(s), e.g., SiS2 with an associated feature at 16.8 μm, SiC dust with carbon impurities at 11.3 μm, carbon and silicon mixtures at 9.5 μm, SiC core-SiO2 mantle grains at 8.3 μm and 11.3 μm, Fe2O3 at 9.2 μm, 18 μm, and 27.5 μm, and Fe3O4 at 16.5 μm and 24 μm are all rejected for a viable candidate (see Zhang et al., 2009 for details). This lack of agreement is evident since the 21-μm feature is usually weak compared to the associated features in the experimental spectra of the proposed candidate materials while the opposite is the case in observations. With the two criteria (i.e., the requirement of abundance to account for the observed high intensity of the 21-μm feature and the requirement of no clear associated feature) taken into account, among the inorganic carrier candidates only FeO (as originally proposed by Posch et al., 2004) survives, as both Fe and O are rich elements and FeO has no associated feature. However, it is not clear how FeO can form and survive in a C-rich environment. The summary of the examination results on the inorganic carrier candidates is described in Zhang et al. (2009). The same examination procedure should be performed for the organic carrier candidates. From the abundance point of view, the organic materials are not expected to have a problem since they are composed mainly of carbon and hydrogen, both of which are abundant elements. However, they may have a big problem due to displaying associated features that are not observed in the 21-μm sources. For example, PAHs, as one of the organic carrier candidates, show a distinctive series of features at 3.3, 6.2, 7.7, 8.6, and 11.3 μm. In fact, thirteen among the sixteen 21-μm sources have such PAH features (mostly around 3.3, 7.7, and 11.3 μm), which makes it reasonable to list PAHs as a carrier candidate. However, the intensity ratios of the 21- μm feature to the prominent features at 3.3–11.3 μm of PAHs can be problematic. Other organic species may face a similar dilemma. Pick out the evolved stars from the IRAS PSC (Point Source Catalog). Since the 21-μm sources are not necessarily limited to the post-AGB phase, stars in a broad evolutionary stage, from evolved AGB stars to PNe, are selected based on the IRAS color indices, specifically, log F25/F12 >-0.2 and log F60/F25 <0. The combination of these two color indices are to exclude young stellar objects (YSOs) and galaxies and leave with us only evolved stars (van der Veen and Habing, 1988). The selected stars should have high-quality IRAS photometry at 12 μm, 25 μm, and 60 μm. Look for the counterparts of these sources in the MSX PSC catalog. The cross-association is done by position-matching. Only those sources in the sky area surveyed by MSX, mostly in the Galactic plane, are left. The selected sources should have high-quality MSX photometry in the MSX C (12.13 μm) and E (21.34 μm) bands. Find the sources with excess in the MSX E band. Figure 1 is the color-color diagram of log F25/F12 vs. log FmsxE/FmsxC of the sources chosen above. We fit these data by a quadratic line which approximately represents the mean values of log FmsxE/FmsxC. The objects lying above this line would appear to be more likely to have the 21-μm emission feature. As the MSX C band (12.13 μm) is an analog to the IRAS 12-μm band, and the dust continuum radiation in the MSX E band (21.34 μm) should not differ much from that in the IRAS 25-μm band, the objects lying above the fitting line are considered to have an excess emission in the MSX E band. Color-color diagram of the sources with good quality measurements in both the IRAS 12-μm and 25-μm bands, and in the MSX C (12.13 μm) and E (21.34 μm) bands, with the dashed line being a quadratic fit to these data. The selected candidates are denoted by diamond-surrounded dots. Asterisk: known strong 21-μm sources; cross: AGB stars with 10- and 20-μm silicate emission; square: O-rich PPNe with silicate emission; triangle: C-rich PPN without 21-μm emission. Choose the sources whose colors are similar to those of the known 21-μm sources. Because most of the known 21-μm sources are at high latitudes, they were not observed by MSX. We therefore calculate log FmsxE/FmsxC for the known 21-μm sources by convolving their ISO/SWS spectra with the MSX Relative Spectral Response function. It can be seen that, as expected, these known 21-μm sources (denoted by asterisks) are lying mostly above or on (depending on the strength of the feature) the fitting line. In comparison, the C-rich PPN IRAS 19477+2401 without 21-μm emission (denoted by a triangle) is well below the fitting line. In addition, the color indices log F25/F12 of the known 21-μm sources are all larger than 0.5 (because the dust is cold). Therefore, the sources with log F25/F12 between 0.5 and 1.0 are chosen. Exclude the sources which are O-rich or other earlytype objects according to the SIMBAD database. A few of the above-selected sources, which are previously observed and found to be OH/IR stars or Wolf- Rayet objects, are rejected. Exclude the sources brighter than 100 Jy in the MSX E band. This is to avoid the saturation problem in the IRS high resolution mode. This selection process left us with 18 sources that are possibly evolved AGB stars, PPNe, and PNe and have excess emission around 21 μm. They are shown in Fig. 1 as diamond-surrounded dots. Two of the 18 sources were 108 B. W. JIANG et al. : THE 21-μm AND 30-μm CIRCUMSTELLAR DUST FEATURES listed in other Spitzer GO (General Observer) proposals with higher priority. The remained 16 sources were observed from our Spitzer proposal (ID P-30403). They were observed using the Infrared Spectrograph (IRS) with two modules: Short-High (SH) and Long-High (LH) during Cycle-3 from October 2006 to May 2007. The data were taken in “staring mode” with two nod positions along each IRS slit. Due to the anticipated high brightness of the objects, no specific off-set observations were made. Our observations found no new objects showing the 21-μm emission feature, while some objects have features attributed to crystalline silicates which bring about at least part of the MSX-E band excess (Jiang et al., 2009). It is worthy noting that Hrivnak et al. (2009) reported three new detections of the 21-μm feature based on their Spitzer observations. Although we are not yet at a position to conclude that the 21-μm feature exists only in C-rich PPNe, our observations at least suggest that this feature appears only under rigorous conditions and that the sources are truely rare. In summary, we conclude that the carrier candidates suggested to date are mostly unacceptable and that the conditions for the existence of the 21-μm feature are also not very clear. To make progress in the study of this feature, more laboratory experiments are needed to search for materials that can meet the abundance and spectral requirements. In addition, a sophisticated dust model may be helpful. From the observational side, larger scale surveys should be performed on those objects sharing the characteristics of the 21-μm sources, i.e., metal-poor, s-process elements enhanced, C-rich, PPN and so on. However, the Spitzer spectral surveys of the evolved stars in LMC and SMC also did not find new emitters. 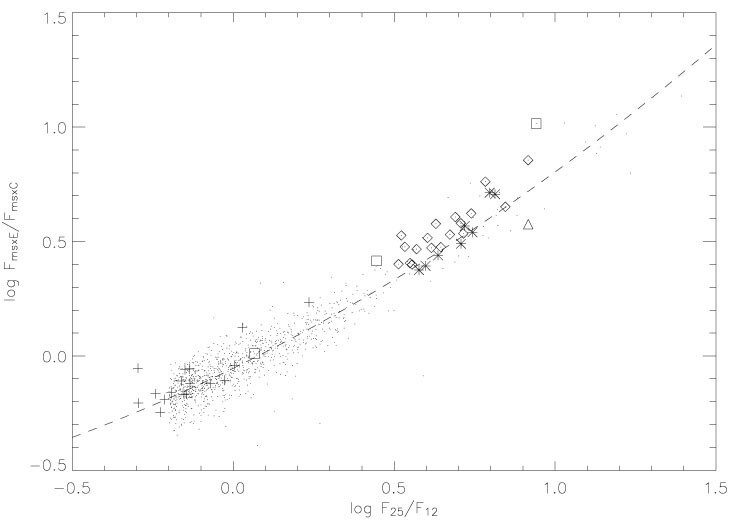 Since the evolved stars in LMC and SMC are mainly C-rich and very likely metal-poor, this result may indicate that these two characteristics are not the key determining factors, or not enough. Perhaps a survey of the C-rich PPN would be a good project to discover new 21-μm emitters. The 30-μm feature is not as rare as the 21-μm feature. Since its discovery (Low et al., 1973) from ground-based observations, this feature has been detected in 63 Galactic objects: 36 evolved carbon stars, 14 PPNe, and 13 PNe (Hony et al., 2002), thanks to KAO (Kuiper Airborne Observatory), ISO (Infrared Space Observatory), and Spitzer. Moreover, the 30-μm emission feature is also found in evolved stars of nearby galaxies, including 17 C-rich stars in LMC (Zijlstra et al., 2006) and eight C-rich stars in SMC (Sloan et al., 2006; Lagadec et al., 2007). The 30-μm feature shows up not only in the PPNe phase, but also in the AGB and PNe phases. The conditions for its presence are not as strict as those for the 21-μm feature. However, like the 21-μm feature, it shows up only in Crich environment. It does not form a special sub-group of the evolved C-rich objects, at least partly due to the lack of a detailed analysis of the 30-μm sources. Nevertheless, there seems to be a borderline of dust temperature for the 30-μm emission. In our Galaxy, this feature occurs from extreme AGB stars on to later stages. In LMC and SMC, this feature was detected only in the coolest stars. Given the uncertainties in determining the specific dust temperature, the highest dust temperature of the 30-μm emitters should not exceed 700 K. The temperature upper limit means the feature carrier exists only in low temperature. The spectral profile, both the peak and width, of the 30-μm feature changes in different objects. The feature peak shifts to longer wavelengths with lower dust temperature for the Galactic sources. The shape changes significantly from object to object so that it even causes debates about the feature profile. One suggestion is that the feature is composed of two sub-features at different wavelengths according to the ISO observation of some PPNe (Volk et al., 2002); the other suggestion is that the feature is monolithic but varies with the temperature and shape of the dust carrier (Hony et al., 2002). The experimental absorption spectra of MgS, a promising carrier candidate, show great dependence on dust shape (Kimura et al., 2005a). MgS seems to be a widely accepted carrier of the 30-μm feature, although other candidates have also been proposed (including organic molecules naturally present in the C-rich environment). MgS was first brought forward by Goebel and Moseley (1985) based on its IR resonance band. Later observations of the 30-μm band were often explained in terms of the MgS dust in the radiative transfer modelling, but the modelling results bring about a few questions on MgS as the carrier. Shape Spherical-shaped dust can not fit the observations well, while CDE (continuous distribution of ellipsoids) can, because the optical properties of MgS change greatly with the dust shape. However, the shape of the MgS dust formed in laboratory is often roundish, network-like, or cubic, rather than ellipsoidal (Kimura et al., 2005a). Moreover, the CDE shape distribution does not easily explain the observed sub-structures (but see Zhukovska and Gail, 2008), thus leading to the suspicion of the reality of the ellipsoidal shape assumption. Abundance For the sources in the Galaxy, the abundances of Mg and S required to account for the observed intensity of the 30-μm feature is usually much less than cosmic abundances of these elements. For example, Jiang et al. (1999) found that 10% of the cosmic S abundance is sufficient. Thus, the MgS abundance seems to present no problem. Nevertheless, the detection of the 30-μm feature in LMC and SMC needs to re-consider the abundance issue since these two galaxies are much more metal-poor than our Galaxy; in particular, the metallicity of the SMC is only about 10% that of our Galaxy. No modelling efforts have been taken for the 30-μm features detected in the Magellanic clouds (MCs), partly due to the lack of abundance measurements of these sources. Quantitative modelling will be very helpful. Besides, whether sulfur is mainly tied to MgS is unknown. From the examination of the Wild 2 dust collected by Stardust, most of the sulfur in the anhydrous dust is concentrated in iron sulfides, whereas no MgS dust was found; besides, some of the anhydrous silicates are Mg-rich (Flynn, 2008). This suggests that both Mg and S may be tied to dust species other than MgS. However, Zhukovska and Gail (2008) pointed out that FeS is abundant only in O-rich environments, while in the C-rich environment, MgS is more stable than FeS, and Mg should not be tied to silicates formed in O-rich environment. This may alleviate the problem of abundance caused by consuming Mg and S to form other dust molecules. However, S can be largely consumed by gaseous S-bearing molecules CS and SiS. Associated features The experimental IR spectra of MgS exhibit some sub-structures, although the associated features depend on dust shape (Kimura et al., 2005a). This might be good news for the argument that the 30-μm feature is composed of two sub-features, but whether the observed and experimental sub-structures agree with each other needs careful comparison. The 21-μm and 30-μm features are the strongest dust features in evolved C-rich sources. They share some characteristics. However, they are different in several aspects, as mentioned in previous sections. Below is a detailed summary of the comparison. Profile The 21-μm feature is not symmetrical, but has a steep rise in the blue wing and a long tail at the red end of ∼23–24 μm. It is certainly a one-component feature. More importantly, the profile of this feature is universal, i.e., there is no clear change from source to source. This leads one to believe that the carrier should be a single sort of dust material with universal properties in various sources. On the other hand, the profile of the 30-μm feature changes so greatly from source to source that a two-component structure has been proposed, as discussed above. The change of the profile could be caused either by the dust properties, such as the shape and size distributions that lead to the change of optical properties, or by the physical and chemical conditions, such as the temperature and metallicity. From the analysis of the 30-μm sources in our Galaxy, Hony et al. (2002) found that the feature profile is related to the dust temperature. This feature appears to be weaker in the low-metallicity SMC than in our Galaxy (Sloan et al., 2006), but there is no significant difference between LMC and our Galaxy (Zijlstra et al., 2006) even though LMC is clearly metal poor compared to our Galaxy. Therefore, it seems that the metallicity is not directly correlated with the strength of the 30-μm feature. Emitters First, both features are detected only in C-rich sources, and in the very late stages of evolution. The 21- μm feature is detected only in PPNe, the very short transient phase of stellar evolution, while the 30-μm feature shows up from AGB to PPNe and PNe phases. In addition, the 30-μm feature is discovered in LMC and SMC where the metallicity is low. There has been no report on the discovery of the 21-μm feature in the MCs, although the 21-μm sources in our Galaxy are metal-poor, but this may be caused by the observation bias: to date, only evolved AGB stars (not PPNe) have been observed in the MCs. It implies that the carrier of the 21-μm feature can survive only in a narrow range of physical conditions. On the contrary, the dust for the 30-μm feature can survive in various environments, in particular, its survival to the PNe phase would bring it to the ISM to participate in the cosmic dust re-cycling. Co-existence All the sixteen 21-μm feature sources show the 30-μm emission feature. Early in 1995, the 16–46 μm spectra were taken for five 21-μm emitters by KAO. It was found that the 30-μm feature is present in all of them, while the intensity of these two bands are not correlated (Omont et al., 1995). Later, from the ISO/SWS and Spitzer/IRS spectra, Hrivnak et al. 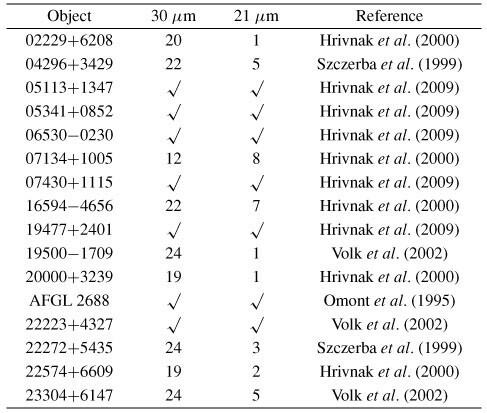 (2000, 2009) discovered new 30-μm emitters and quantitatively analyzed the percentage of the total IR flux emitted in the two features (see Table 1). The 100% incidence of the 30-μm feature appearing in the 21- μm emitters may lead to the proposal that their origins are related. But this is challenged by the fact that their strengths are not correlated. The most promising candidate carrier of the 30-μm feature, MgS, is not suggested as that of the 21-μm feature as it does not exhibit any features around 21 μm. Nevertheless, the carriers for both features are not well identified. They may (partly) share some organic molecules as the carrier, or their carrier may co-exist. The 21 μm feature sources. The numbers under the “30 μm” and “21 μm” labels are the fractions of the total IR flux emitted in the 30-μm feature or the 21-μm feature (in case no numbers are given, ✓ means detected). BWJ and KZ are supported in part by China’s grants 2007CB815406 and NSFC 10473003. BWJ thanks the LOC for financial support. AL is supported in part by NASA/Spitzer Theory Programs and NSF grant AST 07-07866. We thank Drs. B. Hrivnak and Y. Kimura for helpful suggestions.